JLF PRO manufactures and distributes shoes accessories that answer the needs of professionals working in heavy duty environments.  For over 35 years JLF PRO has been at the spearhead of innovation in the standards of excellence in foot care, developing puncture-resistant insoles, anti-fatigue insoles, anti-fungal insoles and thermal insoles for the safety industry. JLF PRO is working closely with podiatrists and major industrial partners worldwide to provide leading edge technology consistently performing in all industries; from automotive to pharmacy, from foods to oil companies.